My daughter requests to make cupcakes ALL THE TIME! Lately I feel like we've been kind of a one hit wonder with plain old chocolate cupcakes with chocolate icing and sprinkles. So when she suggested yet again the other day that we should make cupcakes for a barbeque we hosted on the weekend, I looked to Pinterest for inspiration. 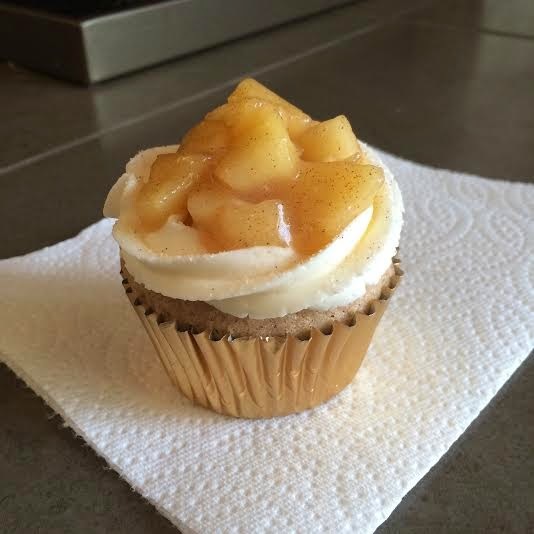 These Apple Pie Cupcakes jumped out at me, courtesy of spoonfulofflavor. I didn't change a thing when I made these, and they turned out delicious. Here is another link to the recipe. I'm linking right to it because this delicious morsel is all down to the original writer. I didn't tweak anything. I have to stress though....always use sifted cake flour when a recipe calls for it. That is the key to having a light and fluffy from-scratch cupcake. It changed my life when I finally stopped ignoring any call for cake flour in a recipe and using regular old all purpose. My dense and heavy from-scratch cupcakes are behind me since finally surrendering to the awesomeness that cake flour provides. I am so glad to hear that you loved the cupcakes, Shannon! I just made another batch last week for an event. Thanks for sharing on your blog and thanks for the picture!